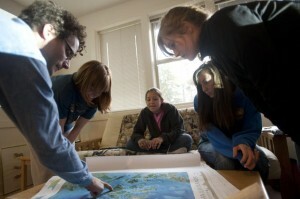 Here is a great video put together by the spring 2010 students. It is a half-hour fantastic eye candy and an elegant visual tour of the 10-week program. 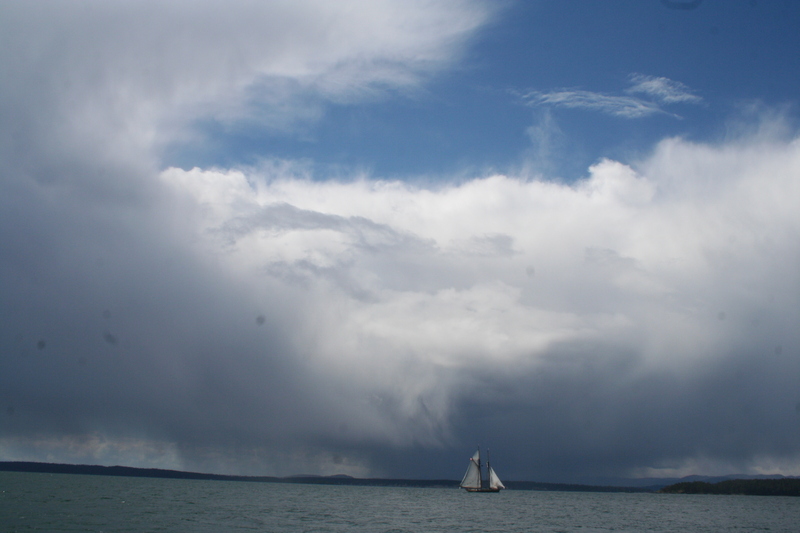 Check out the still photos and video of springtime coming to the San Juan Islands, transient killer whale encounters, a sailboat race, life at sea, rope craft, the southern residents from Ken Balcomb’s boat, data collection, breaching professors, and more. Thanks to Libby, Nora, Horace, and Kathryn for putting it together! This is the best way to summarize our 10 week adventure. Enjoy! 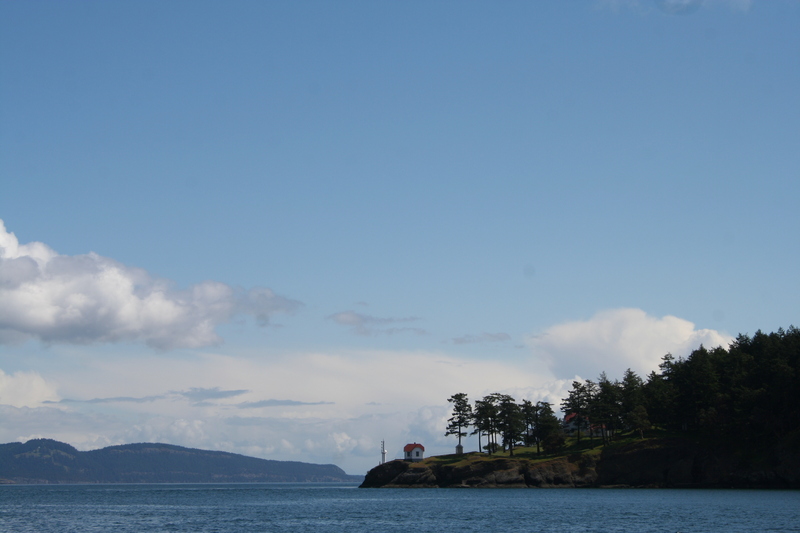 Today we got back on the boat and headed up to Prevost Harbor on Stuart Island. Val came back on board. 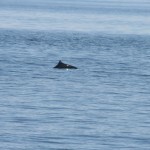 It was an uneventful trip but we did see a few harbor porpoises . Tuckered out after a long day! 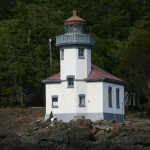 We got to Prevost early so Libby, Horace and I decided to walk the 2.5+ miles to the Lighthouse at Turn Point. We headed out at about 4:30 and walked, and walked and finally came to the School House, a stop approximately 1.7 miles from the lighthouse. It is very beautiful. It reminded me a bit of The Island School from the old days when it was still one big building. 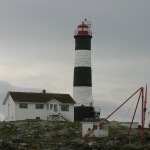 After a brief stop to take some pictures we continued on and walked, and walked, and walked till we finally came to the Light House! It is a really picturesque couple of buildings. 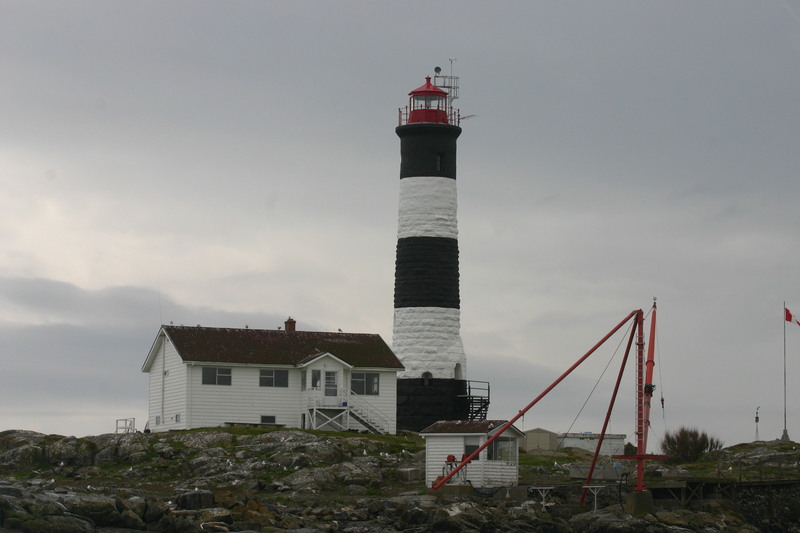 The surrounding area is moss and grass covered rock, which makes it stand out from the forest edge when viewing it from the water, as well as allowing for an astounding view. When we sat down on the steps of the main building, to take a much-needed rest, we noticed a bald eagle perched atop a tree only a little ways away from us. It was chattering away, not a sound I imagined for a ferocious bird of prey I must admit. We also noticed a number of bushes covered with bees! Hopefully they will make a good comeback. We only stayed at the lighthouse for about 8 min. and by the time we got back it was 7:00! 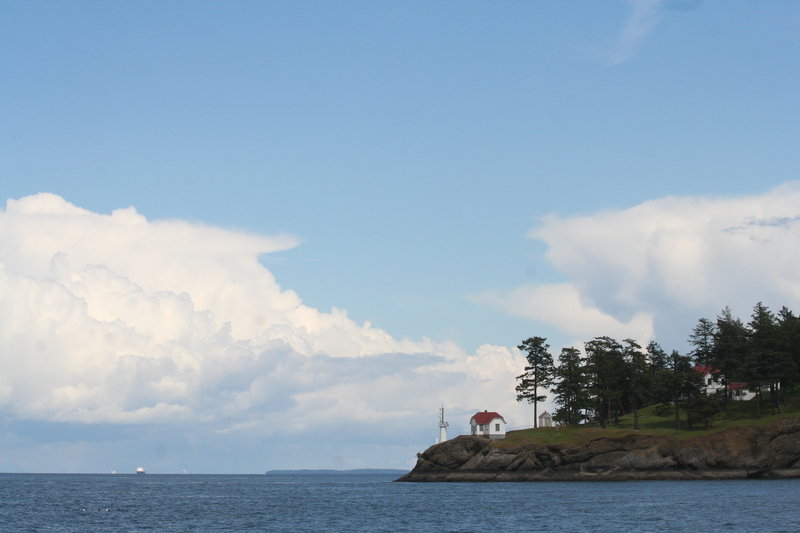 Today we decided to float down the south side of San Juan Island to wait for the still absent residents. 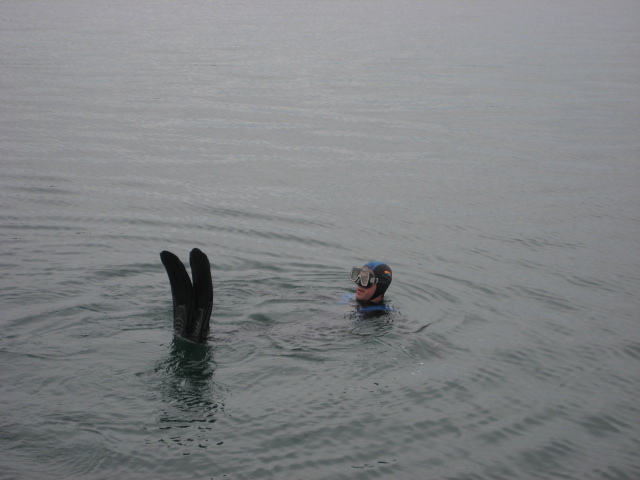 The weather and currents were perfect for Jason to do his swim along the west side. We drifted to Lime Kiln and he jumped in and swam South with the current for an hour covering roughly 3 miles! We took lots of pictures and video of the whole thing for the web page we will make about it. When he came out he was pretty cold, but luckily he had his wetsuit on so he didn’t have hypothermia! 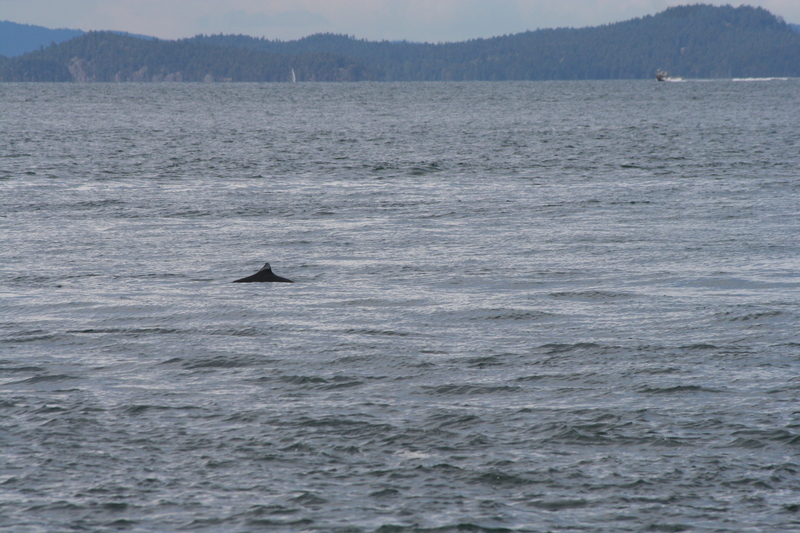 We drifted for a while more and saw some more porpoises. 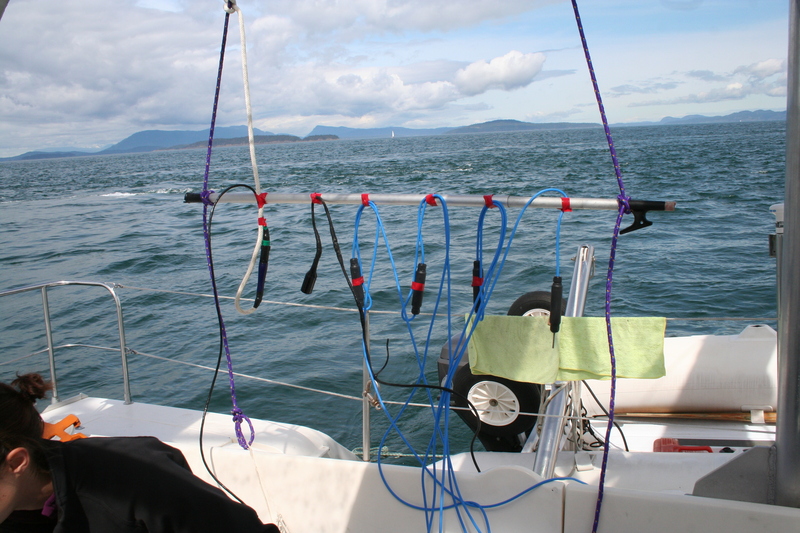 Once while we had the hydrophone in we heard a sound a little like wind chimes if you treated them like a flute. It was very strange, but beautiful. 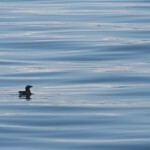 We also heard at least one whistle like call from the porpoises. Today we went to Race Rocks! 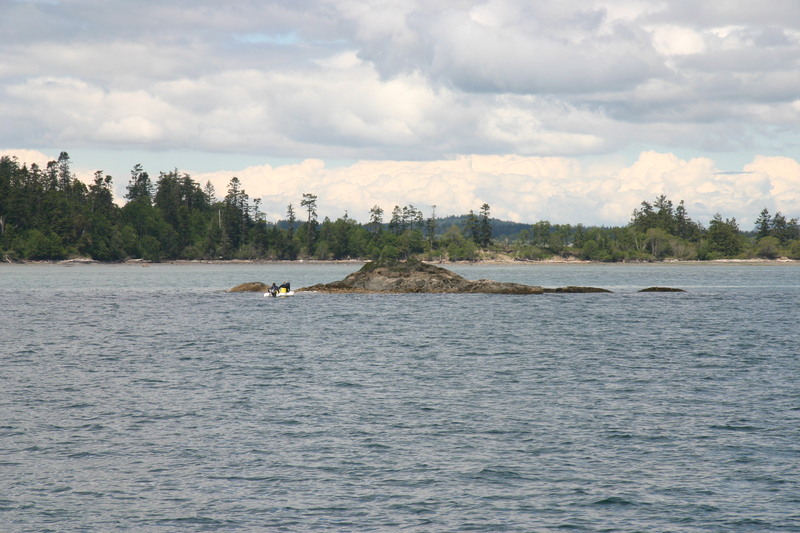 Race Rocks are a few very small Islands, that are really just one big rock surrounded by a few smaller ones, off of the southern tip of Vancouver Island. 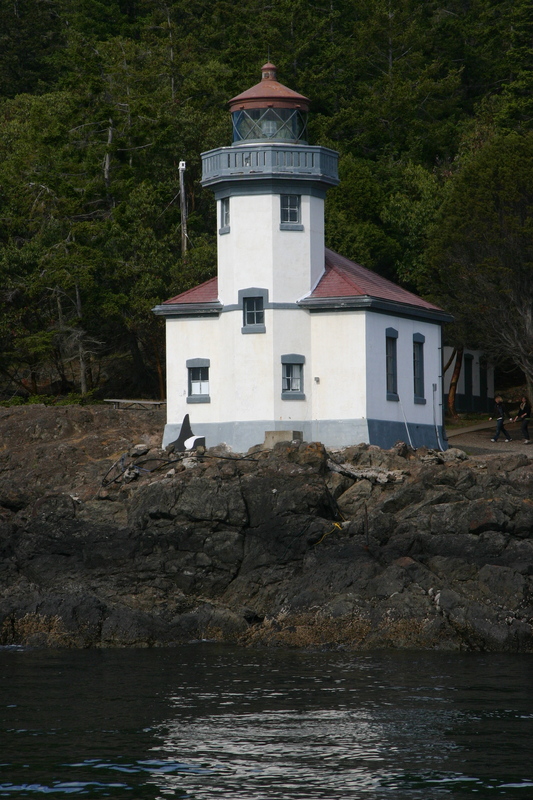 They have a research station and a lighthouse on the rocks and the area is known to attract all kinds of sea life. We saw a bunch of harbor seals hauled out and a few Californian sea lions, what we thought was a baby Californian sea lion as well as a few porpoises. One of the porpoises even dove right under the boat while Horace and I were standing on the trampoline. It was amazing! 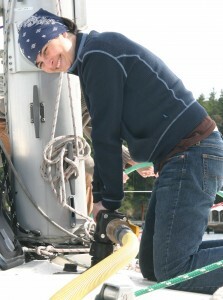 We decided to pump out in the morning before going to look for the whales. Pumping out involves unscrewing the cap to the sewage tank and putting a suction hose over the hole and sucking up everything in the tank. Great job I know. Everyone would hope that they were in the place least far from the position one needs to be in to get the hose handed up to them. Today was my unlucky day and I got to hold the nozzle. Val was kind enough to go and get some donuts for everyone! 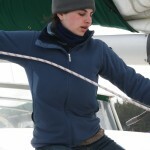 We had another day of sailing and fun! 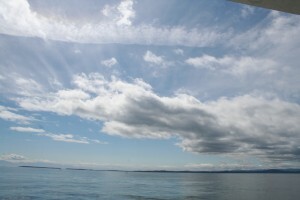 The weather was great and lifted our spirits despite the lack of whales. Today we decided to look for the fish-tracking device that Scott and Jason deployed last year for part of a NOAA fish study. WE couldn’t see the rope we were looking for from the dingy so I decided to be the brave soul who would jump out of the dingy onto the rocks Jason thought he draped the tethering /retrieval rope over. In doing this I managed to sustain barnacle inflicted injuries to my palm. I was very displeased. After jumping around on the rock for a while I still couldn’t spot the rope so we made a few more passes near another rock after I returned to the dingy, but alas we never found the rope and therefore couldn’t deploy the new fish tracker. After returning to the boat we decided to get recordings of the Gatito driving at different speeds for the group project we are doing. Besides being something we needed to do It also gave Jason and Libby a chance to joy ride in the dingy! 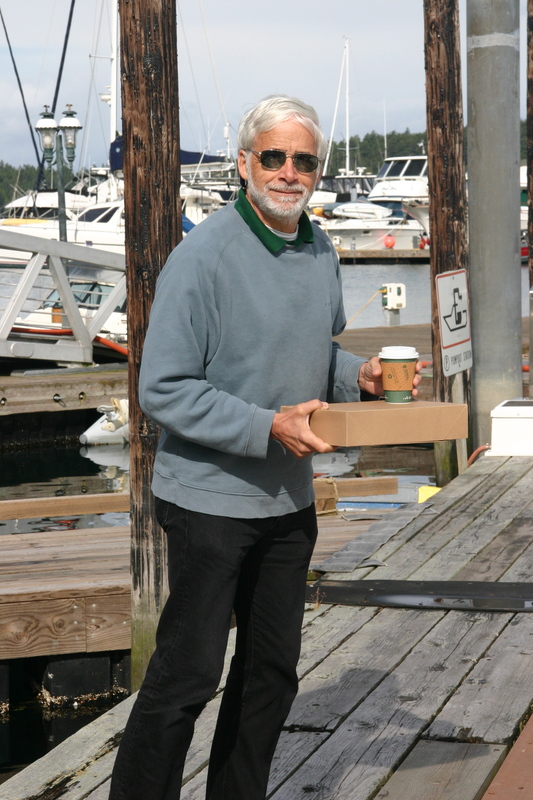 I headed off the boat with Val this morning to go to Lime Kiln to meet with a man named Dr. Bob Otis. 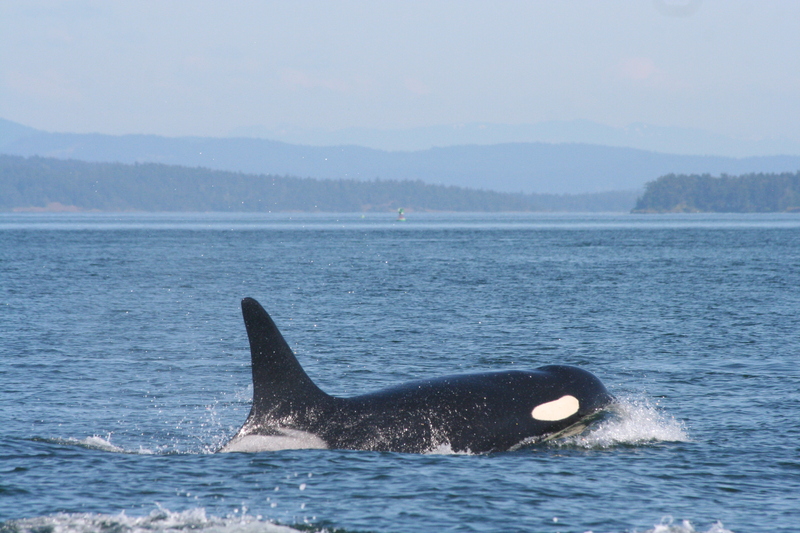 He does research on Orca at the lighthouse and he kindly offered to share the data he has gathered over the years on turnaround events. I was able to gather quite a few turnaround events and their corresponding recordings! I am very excited as I no longer have a sample size of only 6! 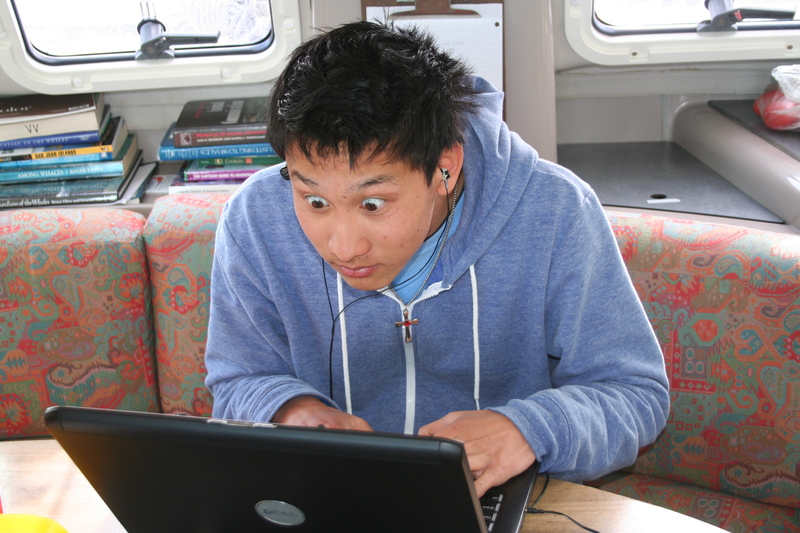 During my data mining someone shouted “WHALES!” and I jumped up thinking that they were orcas. 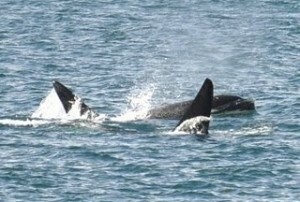 I was mistaken they were humpbacks, a mother and her calf! They swam not 20 feet off of the shore. I could see their blowholes; they looked to be at least the size of my fist. It was awesome!! After I found all the data I needed I left the lighthouse to meet up with everyone at the labs. Unfortunately I forgot that I didn’t get phone service at the lighthouse so I couldn’t call Libby for a pick up. I started to walk thinking ‘hopefully this wont take more than two or three hours’. Luckily for me shortly after leaving Lime Kiln park a very nice man offered to drive me back to the post office, in Friday Harbor, so I could walk back to the labs. He was very kind and we talked about whales till he dropped me off. I immediately took a shower and did my laundry before heading back to the boat to look at the data I had gathered. At 6 we all got to go to a fundraiser for the whale museum and I won some very cool books at the silent auction! Our table also got two cakes, one flowerless chocolate almond torte and Leslie’s, Val’s amazing wife, ice cream torte. It smelled and looked amazing! 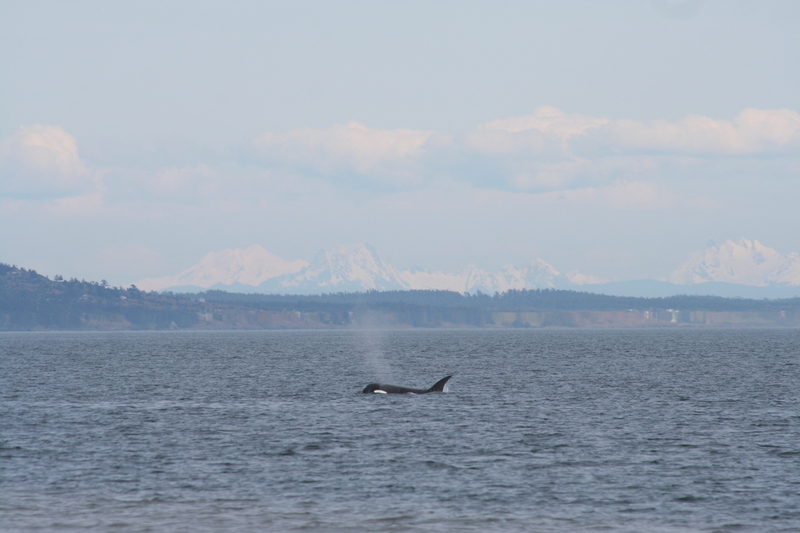 Today we headed out early because we heard that there were some orca coming in toward the islands from the Strait of Juan de Fuca! 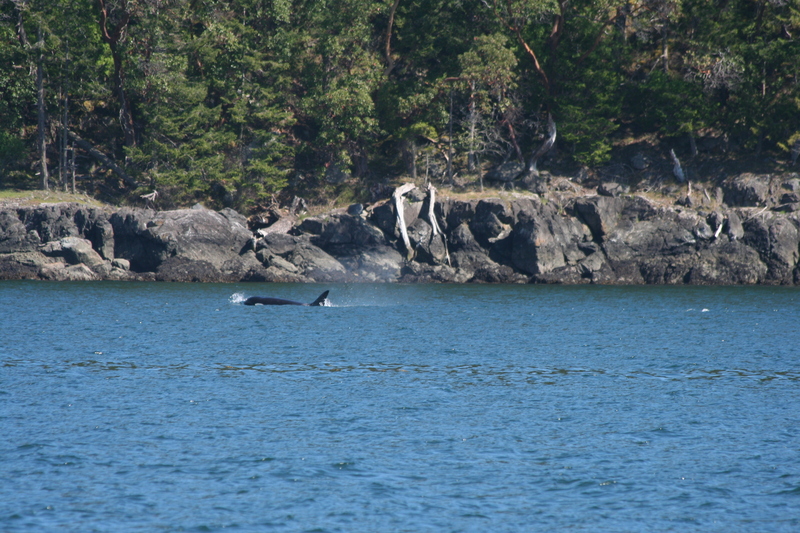 After we got to Discovery Island we found out that the orca were transients. Even so we wanted to see them as we are orca starved, but they remained just out of reach. We headed home with out seeing orca once again to work on our mined data. After we got back to Snug I had my dingy driving training with Todd. It was like driving a car for the first time, I kept thinking that if I so much as bumped onto something or went too fast the boat would EXPLODE! (“Welcome to Johnny Cab”). 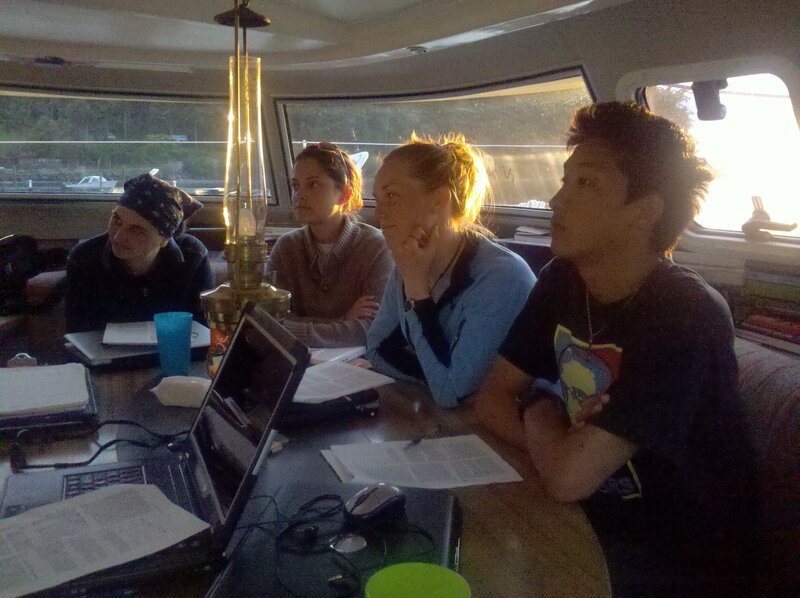 Today we decided to spend the morning at anchor since all of us needed some time to analyze our data. After lunch, when we were all ready to rip out all of our hair and jump into the ocean just to get away from our computers, we decided to sail to a new location for the night. 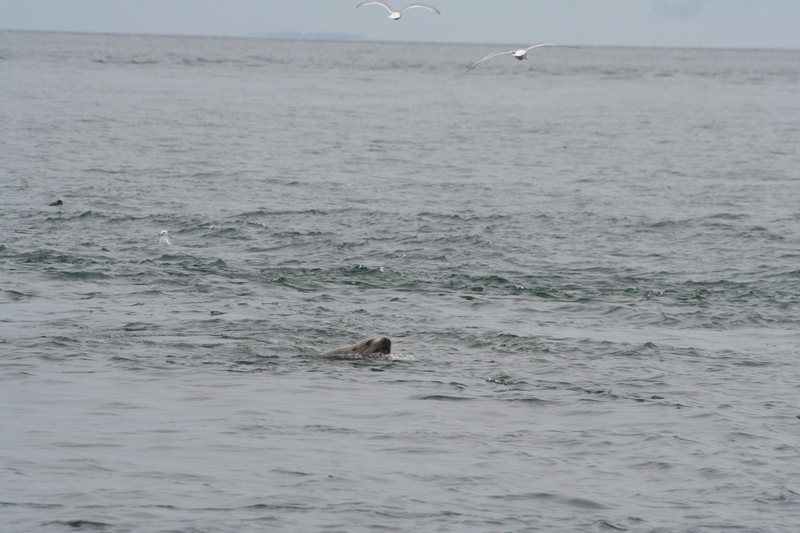 We saw a seal on the way. We did more work after we arrived. Today we found the whales!! 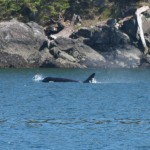 L pod was down by Eagle Point off of San Juan Island. We didn’t find them till late afternoon and only got to spend about 3 hours with them but it was a lot of fun! We decided to hang out at the southwest part of San Juan Island hoping that L pod would head back in through the Strait of Juan de Fuca. 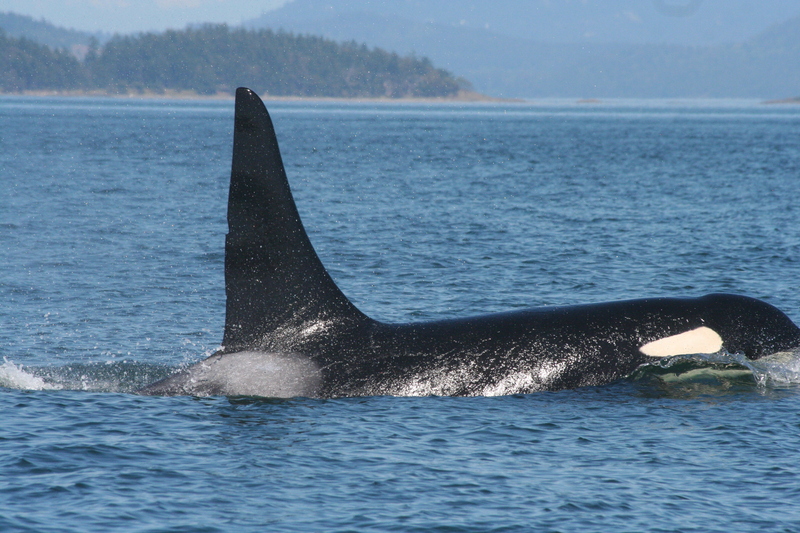 At about 1:00 we heard that J pod was headed in on a strong flooding current but was still about 30 miles from us and we just couldn’t make it to them. We waited for a few hours to see if they were traveling fast and would make it before we had to turn around and head to port. Unfortunately they were moving at a snails pace and wouldn’t make it to us till well after we had anchored. But we hope that they will be here tomorrow. Maybe we will see a greeting ceremony with the super pod. (a greeting ceremony happens when all three pods come together to form a super pod and socialize with a lot of calling). The thing I’m looking at on my computer is called a spectrogram. 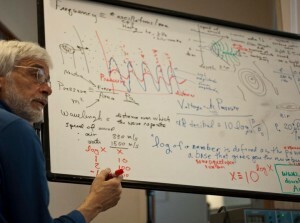 It is a way to look at sound. This is a spectragram. The y axis is the frequency and the x axis is the time. The darker pink (or yellow when it is much louder) is the amplitude (volume). Scott came back on board today! 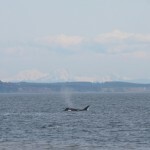 He told us that he had been listening to the Lime Kiln and orca sound hydrophones till about 2:30 to 3:00 am last night! He heard L and J pods chattering away a lot. We decided to head south this morning to try and see if they were below Lime Kiln. 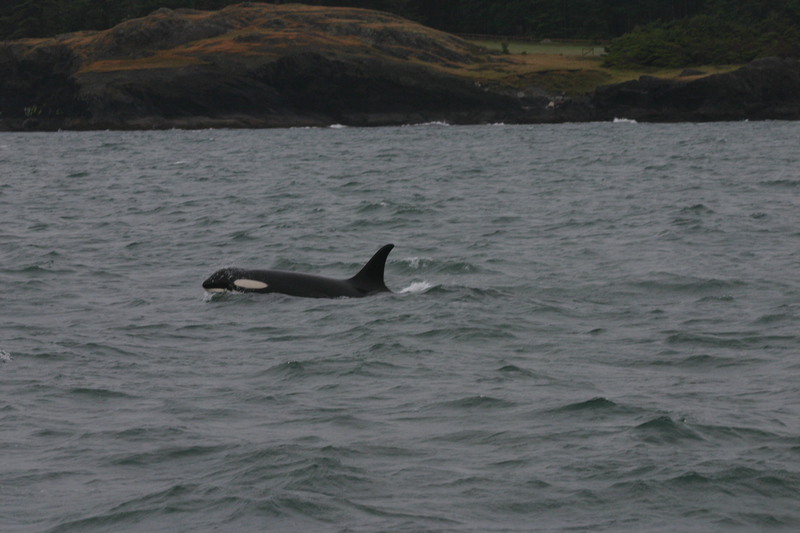 We heard that they were heard on the Lime Kiln hydrophone pretty early in the morning so we headed back up to Lime Kiln and found J pod! (well one matriline anyway). 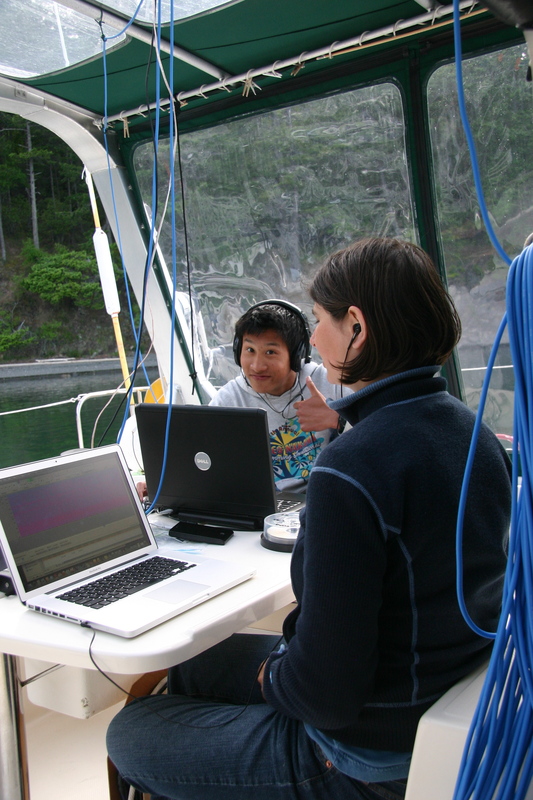 We dropped in the hydrophones and did some data collection. 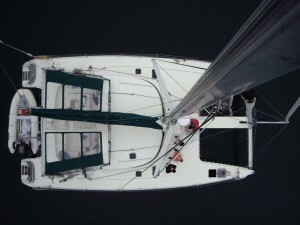 About half way through the day Todd informed us that the window in the port head (the ‘escape hatch’) had opened part way and half of Haro Strait was now sloshing around in the bottom of the boat! Kathryn and I decided to help out and started cleaning up. When we put up the floorboards we saw that there was about a foot or two of water in the bilge (the bottom of the boat). Because of the tissue paper from the trashcan, the pump was getting clogged so Kathryn and I bailed all 125 gallons of it out by hand! Since we had such great luck yesterday (and the weather was crappy [apparently having whales and good weather at the same time is too much to ask]) today we decided to go and try to find them again. We found them! They were swimming rather erratically and during our time with them one male came very close to the boat, so close in fact that we could see him under water for one dive. There was also a new baby with the group (pic to the left). It was very interesting watching it come to the surface because unlike the others it would always stick its head all the way out of the water and do a half belly flop. I thought that maybe it wasn’t coordinated enough yet to do a smoother surfacing. This was also true when we saw the pod resting. Unfortunately we the whales were swimming against the current, something that we cant do very effectively, so we had to leave earlier because at full throttle we were making about two knots to their six or seven! Today the whales were far out of our reach in the morning so we decided to stay in the harbor till about 11:30 and then head out for some sailing for the last day. 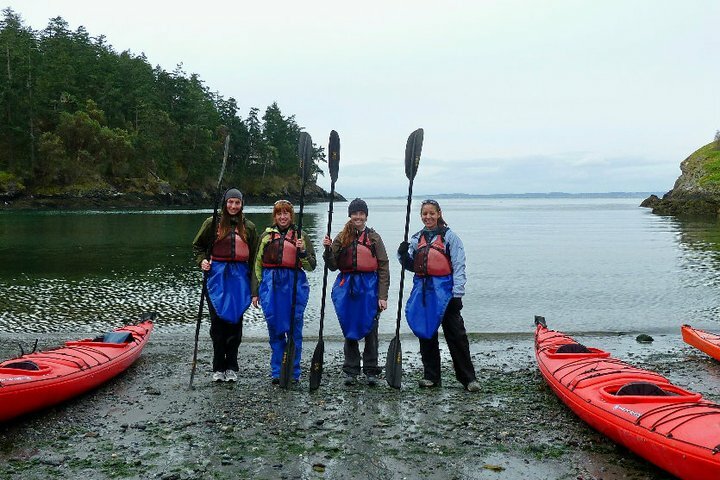 The winds were great and the seas were rough, but in a fun way! We all got on the bow as the waves were crashing over it and it was exhilarating! Strangely enough I was the only student in full rain-gear! Even so I still managed to get a little wet! It is much widnier than it looks, there were big waves coming over the bow! Right before we entered Cattle Pass heading towards our harbor for the night, we heard the mainsail come down and realized that it had snapped! 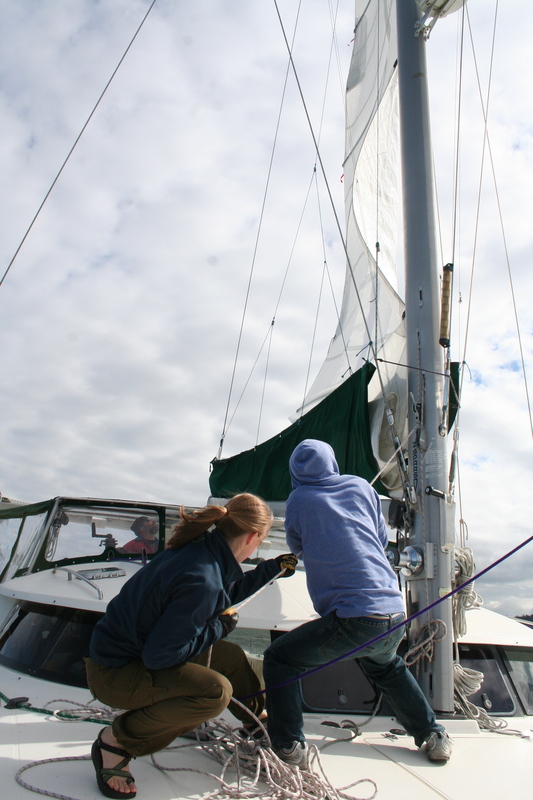 The supports that kept the mainsail attached to the main halyard (the rope that hoists the mainsail) came unsown and the whole sail dropped. Crazy hunh? Due to this unfortunate event us students got do something very cool. 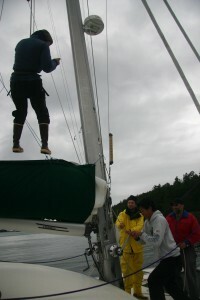 We got to hoist each other up the mast!! 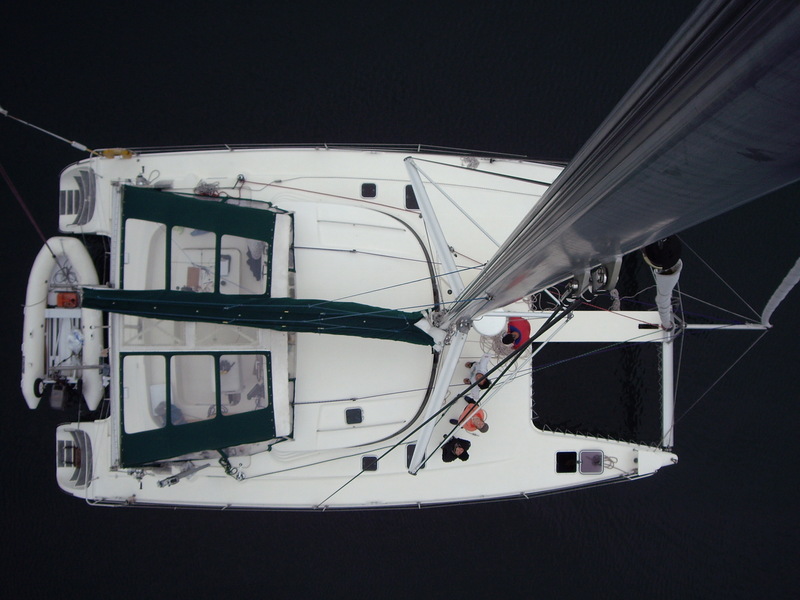 It was amazing, and kind of hard to keep yourself close to the mast when you are at the bottom. 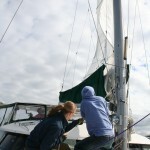 Luckily all f us were lighter than the mainsail so it wasn’t too bad. For an extra special treat Scott cooked us some Thai curry that was amazing as well as making homemade applesauce, really good homemade applesauce! Tomorrow begins the 7 days of super studying! 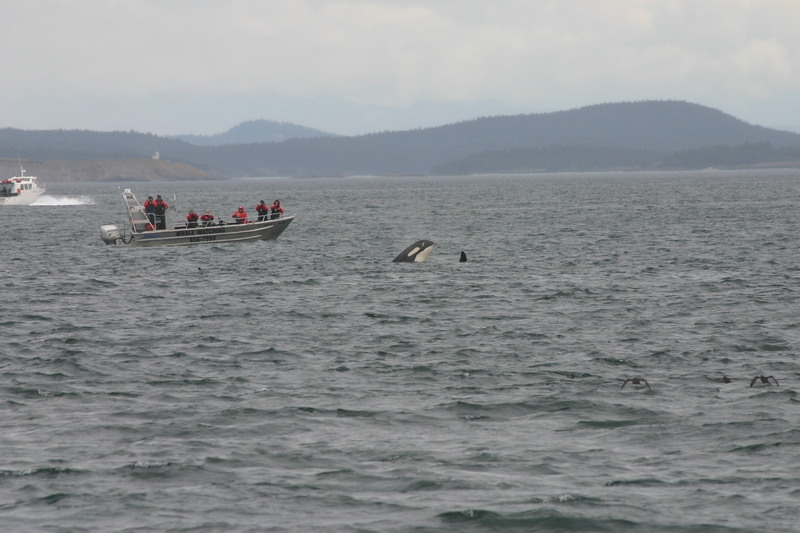 Still no Southern residents, but we did see an interesting wet suit and flipper-clad creature in Haro Strait today! 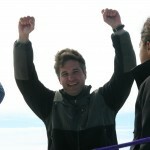 Jason swam three miles along the West side with the goal of contextualizing NOAA’s proposed vessel regulations, which, if put into practice, will impose restrictions on boats when whales are present. 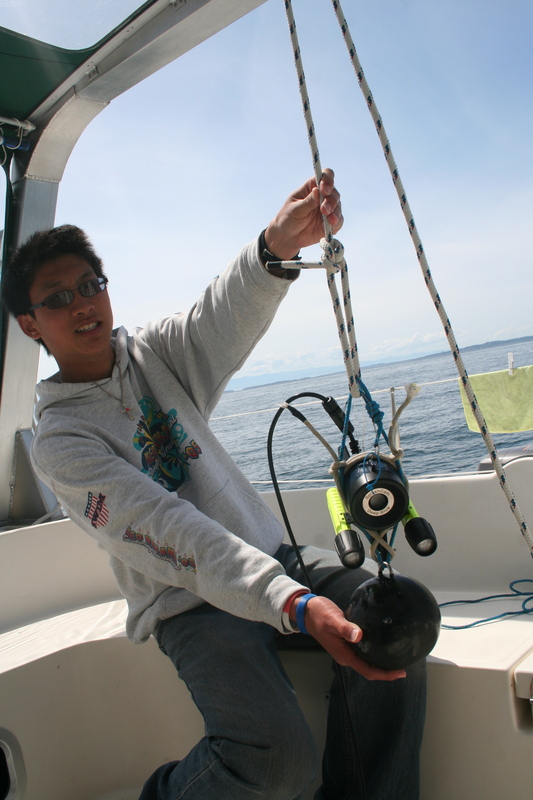 As our “whale,” Jason swam to show what Haro Strait is like from an orca’s point of view. While he was in the water we took photos, videos, and sound recordings, which we will organize and display on a website in an effort to demonstrate why NOAA’s proposed regulations would be beneficial for the whales. 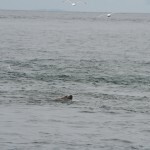 After Jason’s exciting dip in the deep blue, we drifted down the coast for a few miles and saw a variety of marine mammals, including porpoises (harbors and Dall’s) and a Steller sea lion. We’re at anchor now, ready to get a good night’s sleep in preparation for another day of searching… maybe tomorrow will be the day! 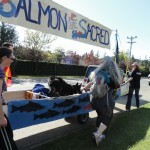 This morning Kathryn and Libby left at 6:30 to go to Sidney, a city a little further North of Victoria on the southern tip of Vancouver Island, to walk to raise awareness about the fish lice outbreak that is occurring in wild runs of salmon due to the presence of fisheries. 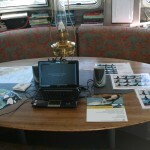 Horace and I stayed to man the boat during the open house day at FHL. It was actually quite fun, contrary to our expectations. People from the community as well as other students and researchers from FHL came aboard the boat to learn a little about what we are doing. We had a whole set-up with a poster, a video of a greeting ceremony (where all three of the Southern Resident pods come together and vocalize a lot) and us to answer questions. Toward the end of the open house I got some time off and I went to see some of the other ‘exhibits’. I saw two of my favorite non-mammalian sea critters, a slimy sea star and a giant orange nudibranch. After the open house was over, we decided that since it was so late we wouldn’t have time to fill the water tanks, get groceries, pump out and find a new port before dark so we would stay the night at FHL. Horace and I spent the night relaxing on the boat. He played on his computer and I caught up on my TV shows. Pathetic I know but CSI shows make me really happy. We left FHL this morning around 10, pumped out and headed out to sea. The weather was amazing, I only wore 3 layers instead of 4 or 5. 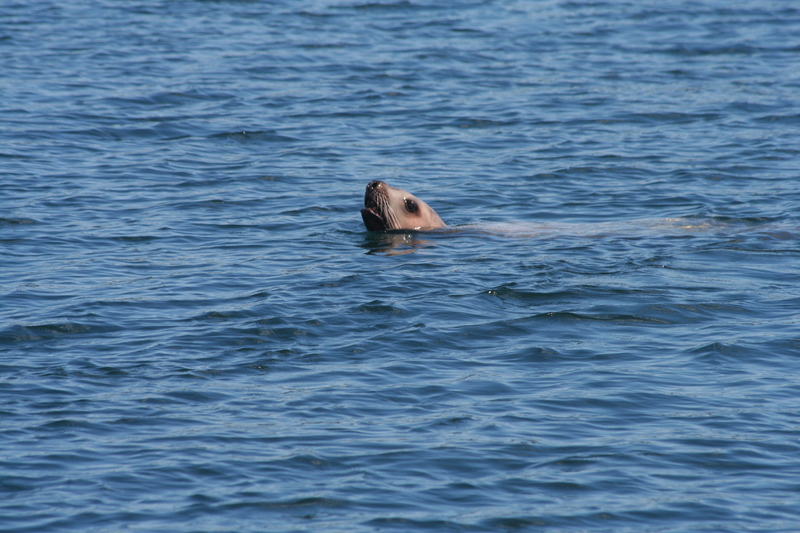 On the way out of Friday Harbor we saw a bunch of harbor seals poking their heads out of the water and looking around. They are getting a lot easier for me to spot. 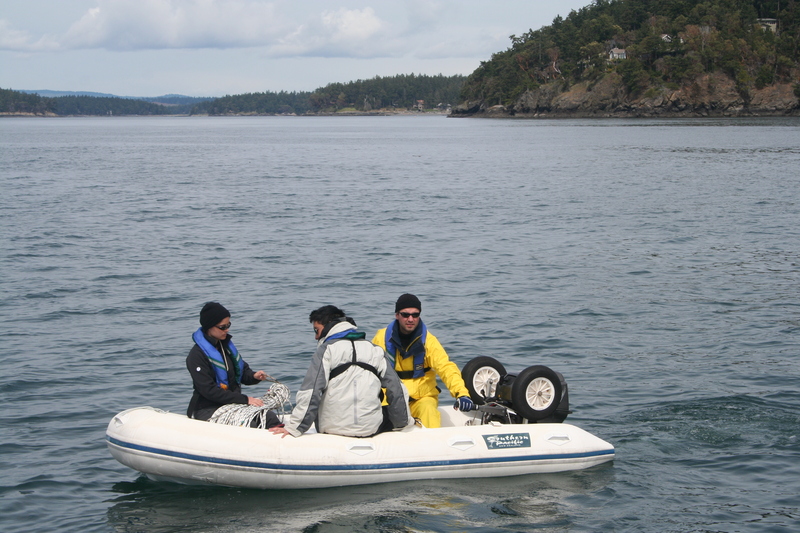 We headed around the southern top of San Juan Island and when we hit Lime Kiln we decided to drop the SplashCam down one more time to try and find the Lime Kiln hydrophone array. After about 15-20 minutes we FOUND the array!!! Finally! We took a waypoint (the GPS coordinates) so Jason and Scott could dive for it later. By this time Libby and Kathryn had been able to contact us to tell us they were back so we headed up to Snug Harbor to pick them up. 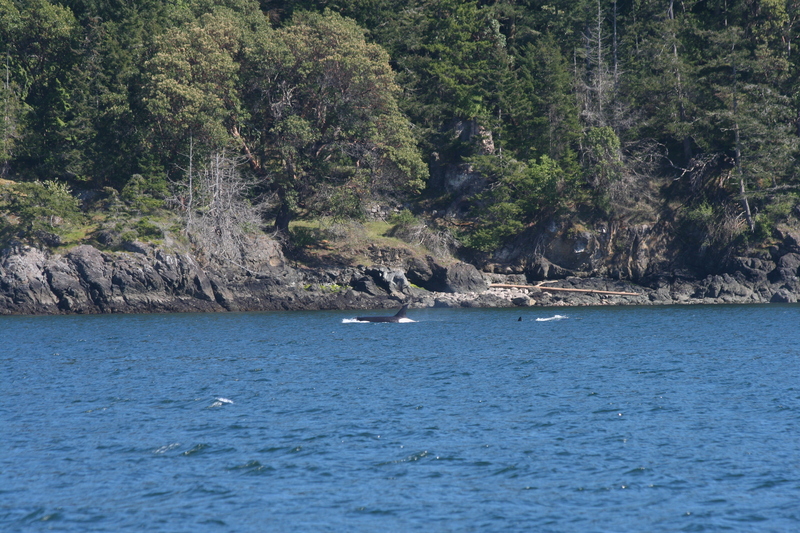 Shortly before we got into Snug we heard that two Transients had been spotted about an hour away, so after getting Kathryn and Libby we headed out to see if they were still there. They were! We think that it was the same two form a few days prior. They had been identified as T124c (a female) and CA58 (a male? a Californian Transient). 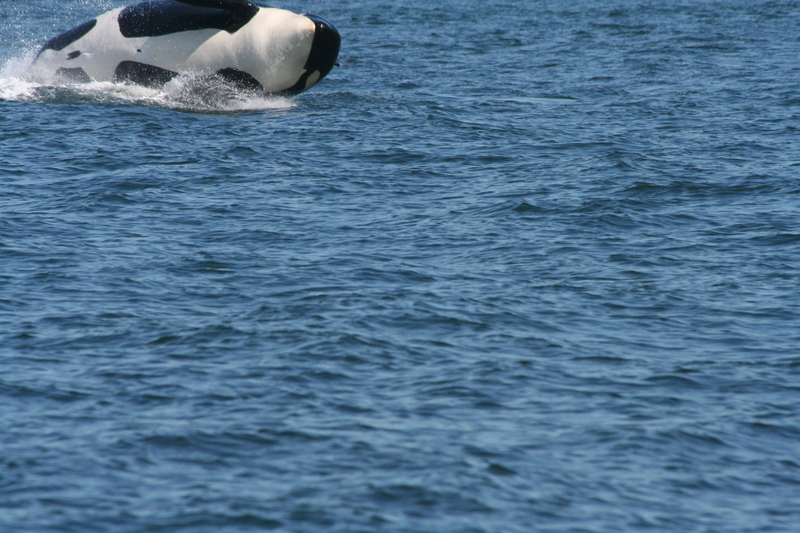 While watching them, we think we saw what is entertainingly called a ‘sea snake’ (a male orca with an erection). 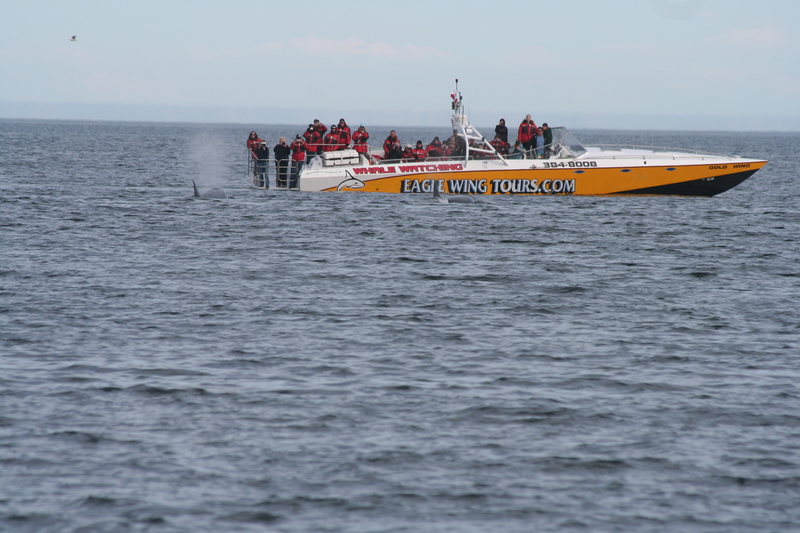 The whales got very close to a few of the whale watching vessels, circling and diving. We thought maybe a seal or something similar was hiding under the boats since we couldn’t think why they would want to be right next to the boat. 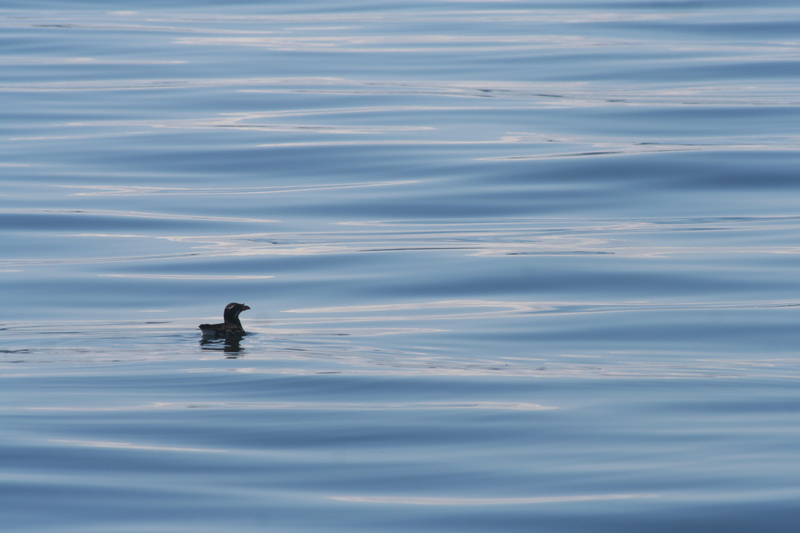 Then we saw the ‘sea snake’ and decided that they were probably just socializing and didn’t care about the boats. About 5 or 5:30 we headed back to Snug for the night and watched the first little bit of “The Life Aquatic”, which is a tradition on Beam Reach. 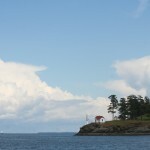 We decided to head out to Discovery Island off the southern cost of Vancouver Island. We were hoping that we might catch the Residents on the way back in to the inland waters. Alas we spotted no whales. 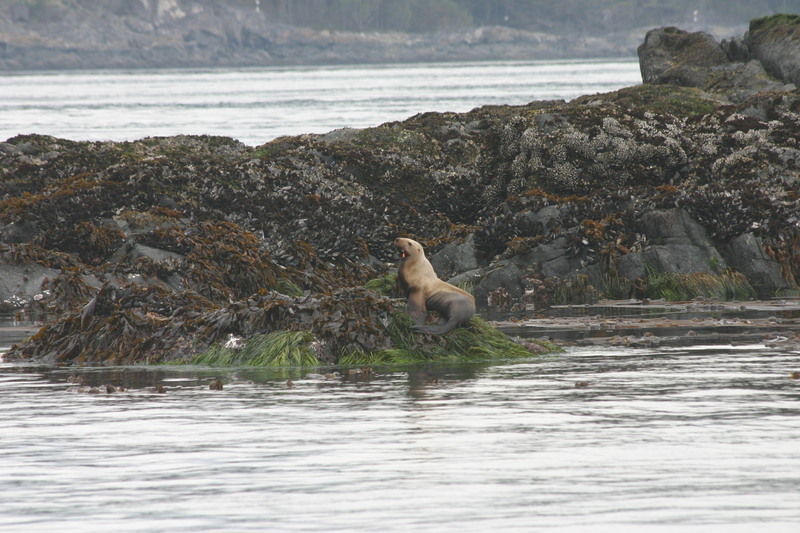 We did however see a stellar sea lion feeding on what looked like a large food source it was pulling giant chunks off of. Today is the last day of our first 2 week stretch at sea and still no Residents! We decided to head out to Discovery Island, again, to wait and try to catch the Residents if they come back in to the Inland waters. 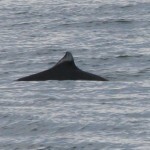 We saw a Minke whale, which was very exciting as as I have never seen one before. 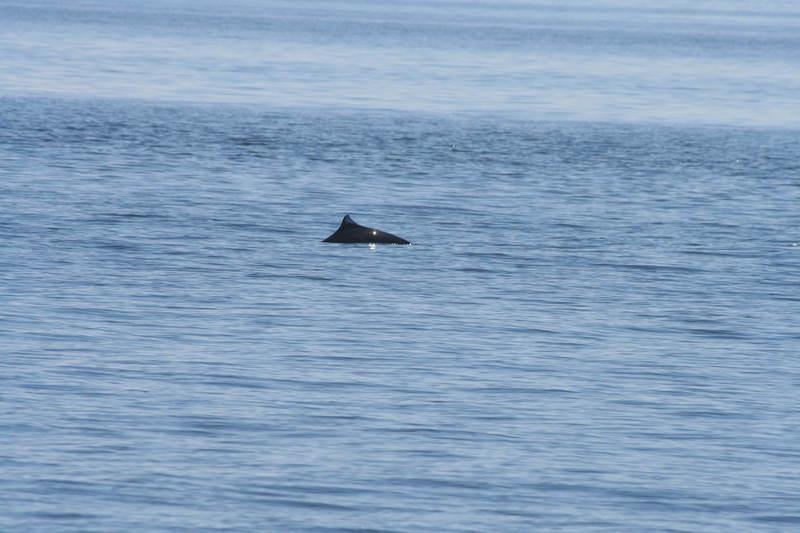 They are incredibly hard to spot and so have earned the name ‘slinky minke’ in these parts, or so I have heard. 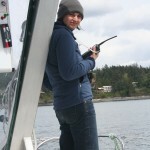 After drifting all day we decided to head back and anchor across from Friday Harbor in Parks Bay on Shaw Island. 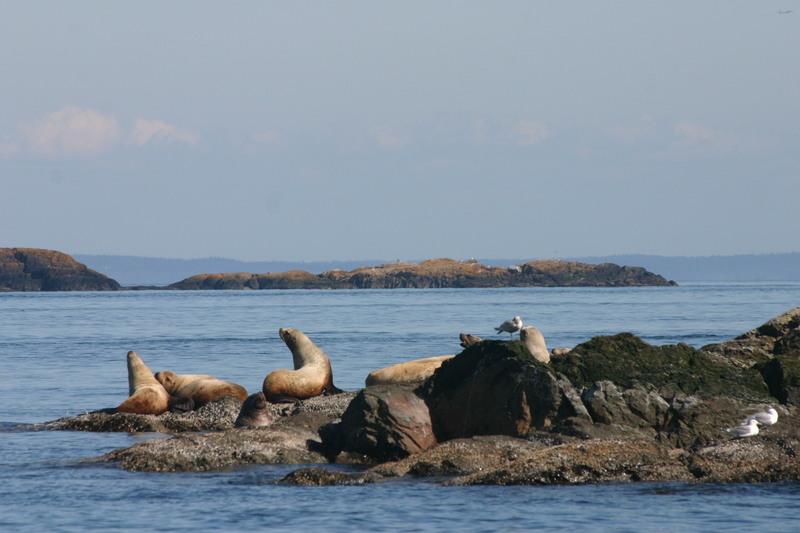 On the way into Cattle Pass we passed Whale Rocks which is a sea lion haul out. 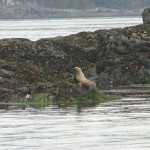 We saw maybe 10 sea lions. It was pretty cool! 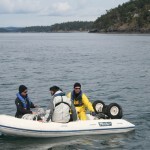 About 3 minutes after we got everything off the Gato Verde and up to Lab 8 Jason got a text abou t a gray whale right outside of Friday Harbor. 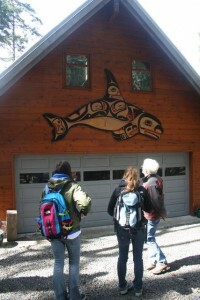 We decided to jump on the buzzard and go get ID pictures of it for the Whale Museum. 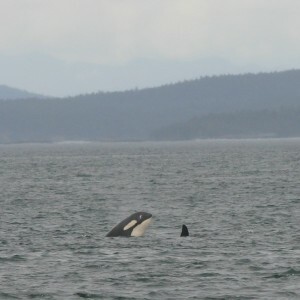 We went out and found the whale pretty quick and even managed to get some great ID pics, which is much harder than it seems. It was interesting how different the breathing noises are between grays and orac, orca are much louder. Today Horace and I went to Wolf Hollow, a wildlife rehabilitation center, for our service project. Wolf Hollow is amazing! They are huge and have a great set-up. 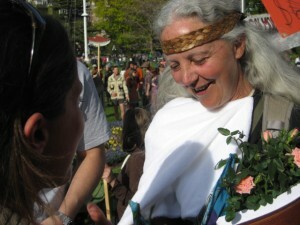 Shona, the head of the center, is very nice. She gave us a tour of the facility when we got there and was a joy to talk to during lunch. Horace and I were given the task of weeding one of the enclosures usually used for herons. I found a lot of slugs on the walls and pill bugs were everywhere. It was like a pill-bug breeding ground, but I like pill bugs so it was OK. About 1 hr before we were scheduled to be done, we got a phone call telling us that the Southern Residents had been spotted close to San Juan Island heading South. Yesterday we went to the Center for Whale Research and met the man in charge, Ken Balcomb. 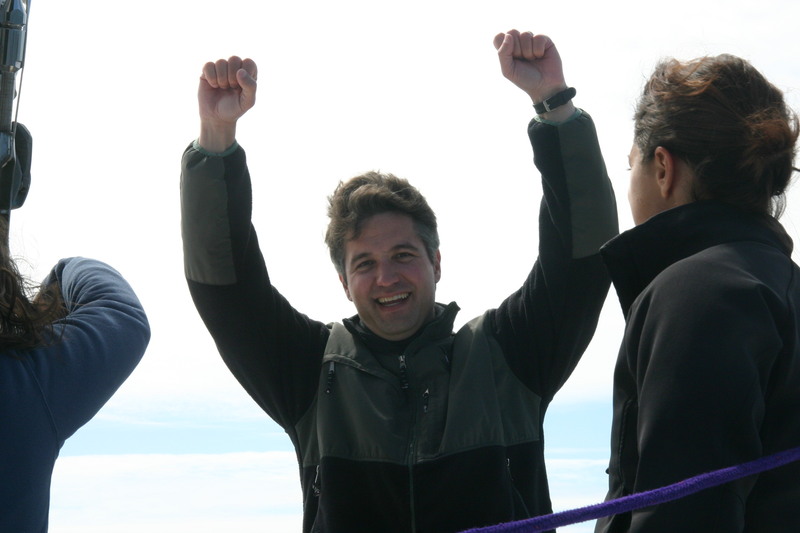 He offered to take us out on his boat with him if the whales showed up. Libby and Kathryn picked us up about 20 min later and we raced over to Snug Harbor to meet Ken, hopped in his boat and went to find the whales. 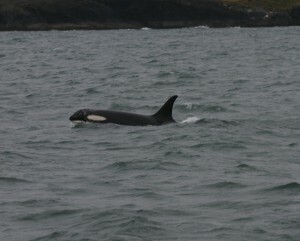 We found them pretty quick and spent the next 2 hrs with him following the whales taking ID shots as well as doing a few recordings. It was one of the most astounding and exciting moments fo my life. I saw two breaches! Ken identified the pod as L-pod. I got blisters on my fingers… and by fingers, I mean toes. My feet have never been so beat up in my entire life, but I can safely say that I sacrificed their happiness for a worthy cause. On Saturday, Libby and I walked from the marina in Sidney, British Columbia all the way to the parliament building in Victoria. 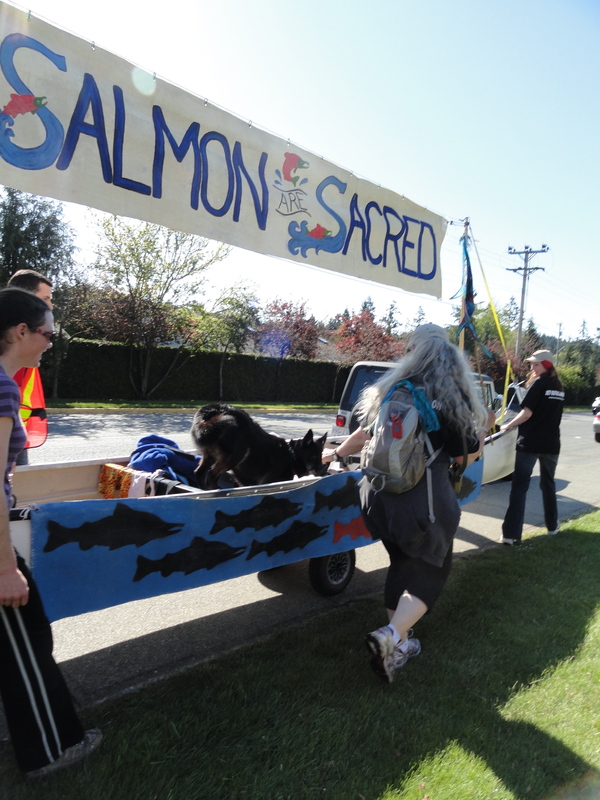 We walked approximately 18 miles with hundreds of other people as part of the Get Out Migration, a march to raise awareness about open-pen fish farms led by a woman named Alexandra Morton. 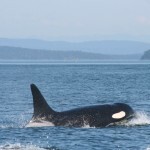 She has lived in the Broughton Archipelago for more than twenty years, researching the Northern resident killer whale community and, more recently, the effects of open-pen fish farms on the wild salmon populations. 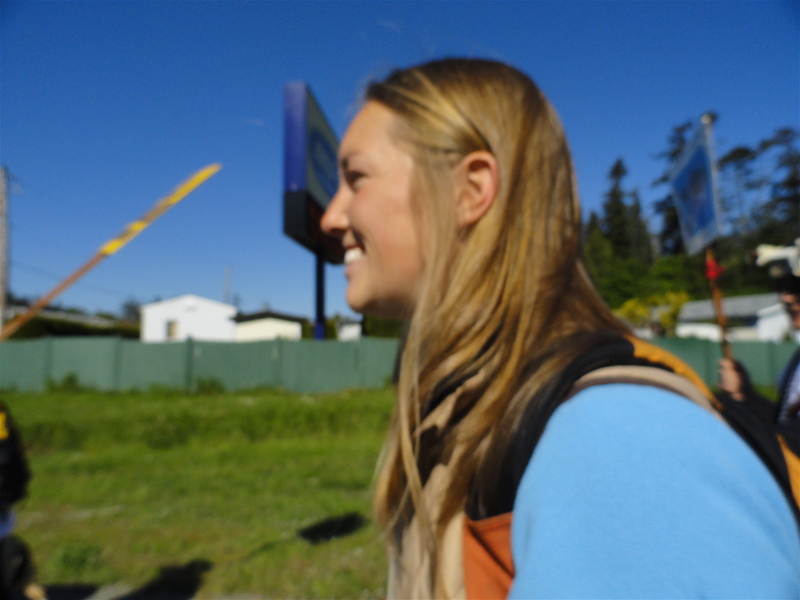 After ten years of working to eradicate Norwegian fish farms from the area, Alexandra organized a three-week walk from the Northernmost to Southernmost tip of Vancouver Island to spread the word about their negative impact on local communities and ecosystems. During a trip to Vancouver Island a few years ago, my father bought me Alexandra’s book, Listening to Whales. I did not read it until last summer, when I was living at a remote research station off the cost of Maine. Her narrative about studying killer whales and her depiction of life as a field scientist was formative for me – since then, I have dreamed of meeting Alexandra Morton. When I heard that she was due to walk into Victoria while I was right across the water, I decided then and there that I had to walk with her. After much logistical planning, Libby and I pinned down a ride and set out for Sidney. Because we had to clear customs, we missed the start of the walk at 8 am, so the beginning of our journey was fairly rushed. Walking briskly through the Sidney suburbs without any sight of Alexandra and her entourage, Libby and I started to wonder if we’d be walking all the way to Victoria alone. Just as we were beginning to contemplate hitchhiking, a car pulled up beside us. “Hey, are you guys trying to catch up to the migration?” A young woman named Megan, who turned out to be none other than Alex Morton’s assistant, opened her car door and ushered us inside. “I know migrators when I see them!” she said. Five minutes later, we came upon a train of cars, signaling the back of the migration pack. A woman with long, wispy white hair came into view, and my eyes widened. I was way too sweaty and frazzled to be thrust into the presence of Alexandra Morton already! Libby and I thanked Megan for saving us many uncomfortable miles of walking and started down the road, trailing Alex’s heels and wondering what to do next. Turns out my body is not too keen on the idea of walking 18 miles, so for the majority of our migration to Victoria, I was solely focused on putting one foot in front of the other. Because of this, I did not get the heart-to-heart with Alex I had imagined, but simply being in her presence and taking part in this massive culmination of her efforts was enough for me. After a long day of trekking down Highway 17, we entered Victoria, greeted by a huge group of supporters. 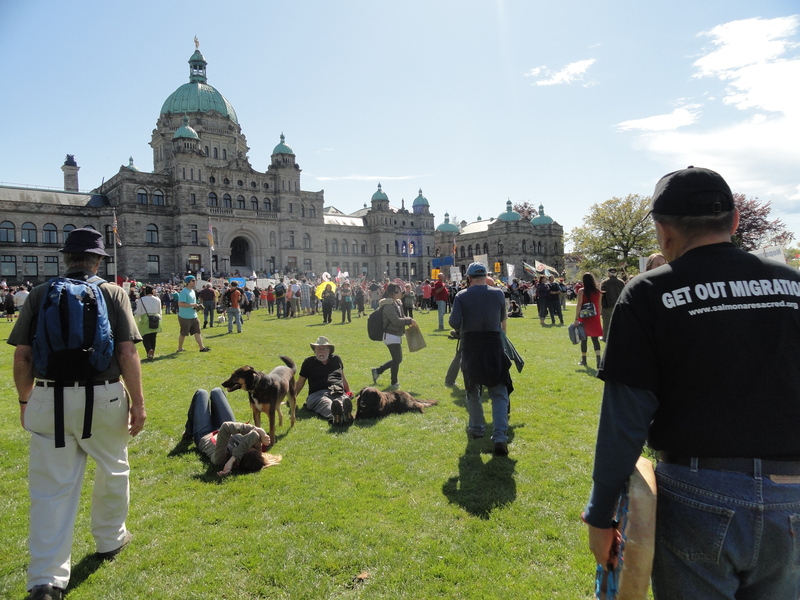 The final 1 km walk to the parliament building was spectacular – thousands of people flooded the streets, marching to the beat of the First Nations’ drum and shouting to spectators. It became evident to me that this is an issue that affects all of British Columbia’s citizens in different ways, but it is undeniable that the effects are uniformly negative. Libby and I collapsed on the parliament building lawn, ready to yank our shoes off and douse ourselves with cold water. The wide range of speakers at the final migration event, from First Nations chiefs to commercial fishermen, spoke of the cross-cultural concerns fish farms have raised. There were so many people crammed onto the lawn that we could not even see the stage, but it was enough just to be able to sit and listen. Alexandra was the last to speak; I had not lost all hope of meeting her, so I tried to keep one eye on her as she snaked back through the crowd amidst roaring applause. Libby pointed. “There she is!” We knew this was the last chance we would get, so we pushed forward until we were standing right in front of her. As this was the end of Alex’s very long journey, I didn’t want to goad her into taking a photo with me or signing my book. I just wanted to say hello, so that’s what I did. Libby somehow managed to snap a candid photo of this moment (she’s amazing! ), and I am so glad she did. Like I said, the blisters were well worth the pain. Today was our departure for the first two-week boat excursion. Todd decided that, since he had access to Costco, he would do most of the re-provisioning which meant that his estimated time of arrival was 2:30 instead of 12:00 meaning a leisurely morning for us. At about 11:30 Jason called to tell us that there was another beached sea lion that he was going to retrieve if anyone wanted to go with. He arrived at about 12 and he and Libby left shortly there after to get the sea lion. We found out that the seal had died from blunt force trauma, probably caused by Transient orca practicing hunting. Horace Kathryn and I stayed behind to bring the equipment down to the Gato Verde when it arrived. Libby called around 12:30 to tell us that the office had said that we needed to be out of S1 by 1:00. We panicked, stored our lunch in the kitchen, ran to S1 and hauled everything down to Lab 8 where the Beam Reach office is. Afterword Horace went to the computer lab and Kathryn and I returned to the dining haul to finish our lunch. We spent the next little while looking up sea shanties that we wanted to learn. After Todd arrived and we got everything on board we decided to anchor at Jones Island again as we really like it there. 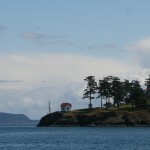 We decided to try and find the Southern Residents by sailing down the west side of San Juan Island, which we usually just call ‘the west side’. It was a beautiful day but by the time we reached Haro Strait, because the currents and wind were fighting each other, the seas were a bit uncomfortable. The sailing was amazing though and we even reached about 13 knots with sails only. Unfortunately I was on lunch once again and due to the size of the waves, some even crashing over the bow, I got pretty seasick. Luckily I didn’t throw up but it was close a few times. We finally made it to calmer seas and I fell asleep. I woke up for our docking, which was at a place called Prevost Harbor on the North side of Stuart Island. It is very pretty and is densely forested, but to get to the land heads you have to hike up a very steep hill. 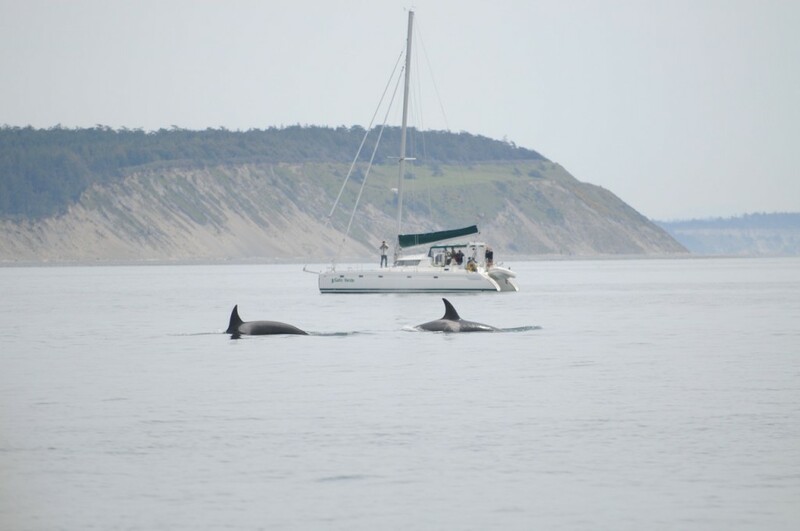 Todd taught us some theory about sailing and shortly afterward we got a call from Scott telling us that J pod had been spotted at Lime Kiln headed North an hour and half prior. 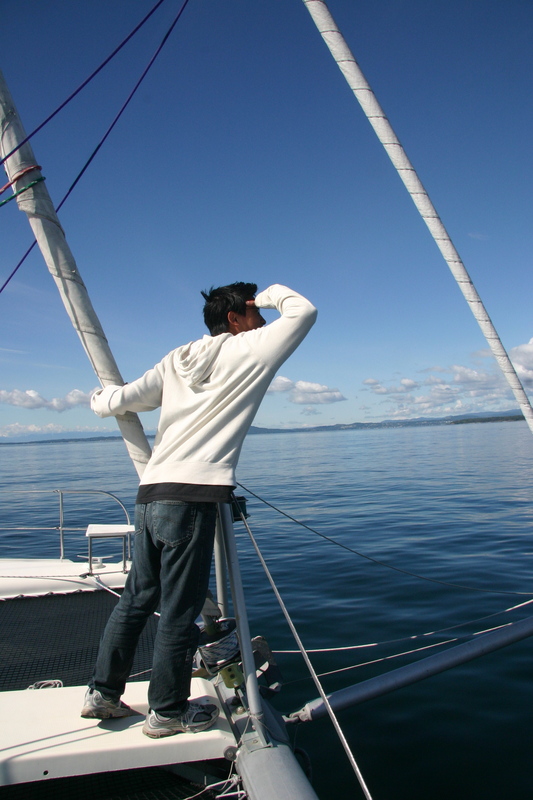 We went back out to sea to see if we could spot them. At the point we saw what looked like a white line of breaking waves from the point across the middle of the ocean. It turned out to be the convergent zones of major upwelling areas caused by the strong tides moving over the rocks on the sea floor around the point. There was a massive amount of gulls there all feeding on the fish that were getting pushed up. Shortly after crossing that area I spotted a dorsal fin! We had found the whales. We stayed out there for about 30 minuets, but it was getting late and the winds and currents were pretty bad. We didn’t get close enough for any ID photos but Jason thought that they were Residents! We are all really excited. We came back, had a very yummy soup and later that evening Jason made brownies and I made my new yummy peanut butter cookies! 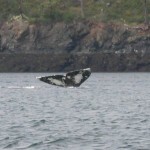 This morning we departed from Prevost Harbor full of thoughts of whales. 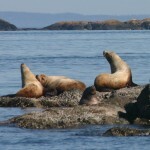 We headed out to the West side of San Juan Island hoping to catch them there. 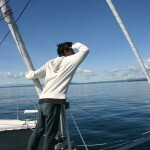 The weather was amazing but alas we couldn’t see any whales. We dropped # 4 of Blueberry (the blue 4 hydrophone array) from the stern of the boat to listen for them and though we heard a bunch of boats, still no whales. 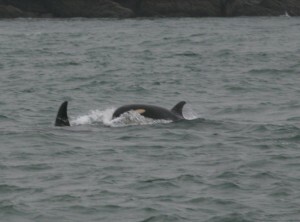 After a few hours we heard that they had been spotted near Anacortes heading down Rosario Strait. They were too far for us to try and catch up to! We decided, after much deliberation, that we should go with the statistics and stay in Snug Harbor tonight betting that the Residents will hang around the West side tomorrow. 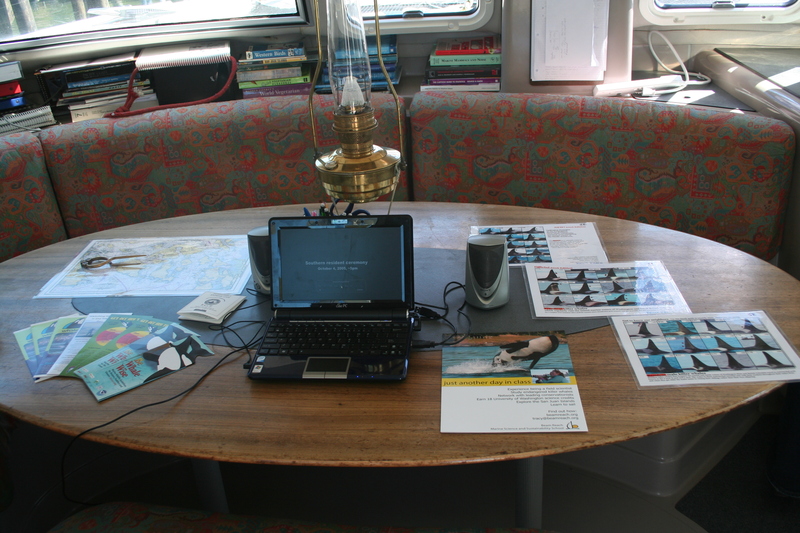 On our way back up to Snug we decided to calibrate the hydrophones. 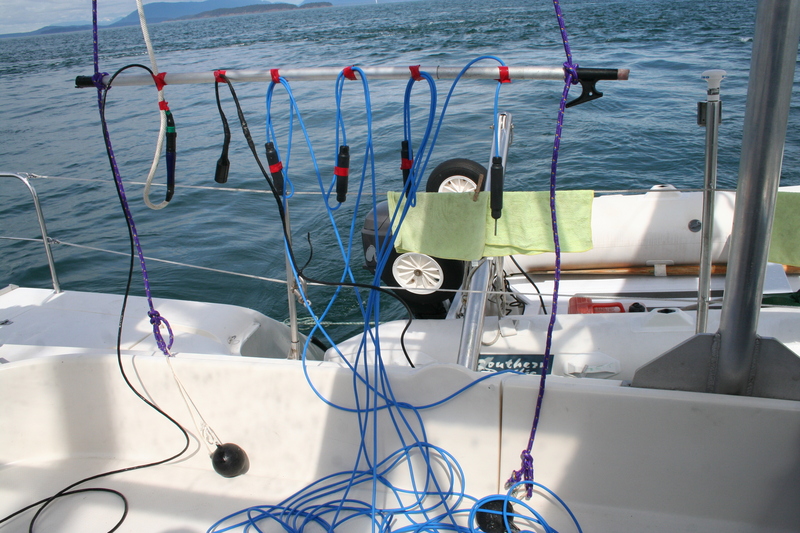 We tied all 6 hydrophones to a pole and deployed them off of the back of the Gato Verde while we deployed the speaker off of the front. 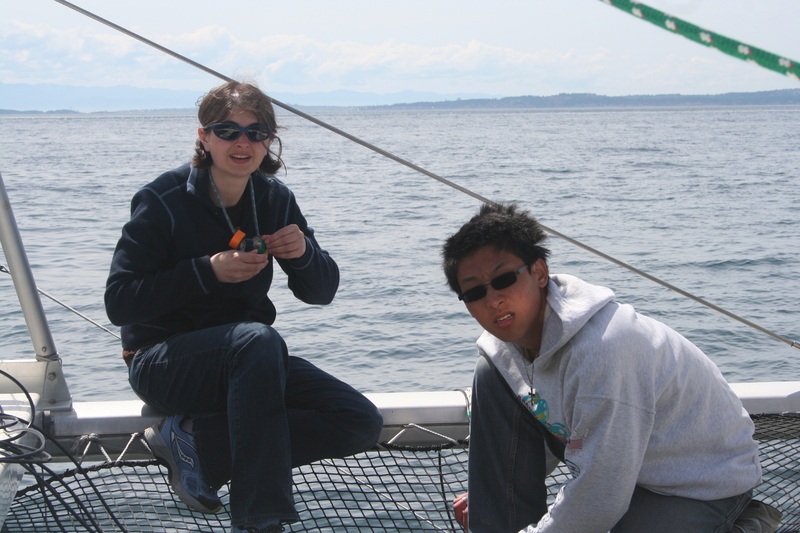 Kathryn and I spent the entire time holding the 4 hydrophones and two 8lb. weights in place away from the boat. When we were finally done we also decided to try and find the lost Lime Kiln hydrophone again with the newly repaired SplashCam. 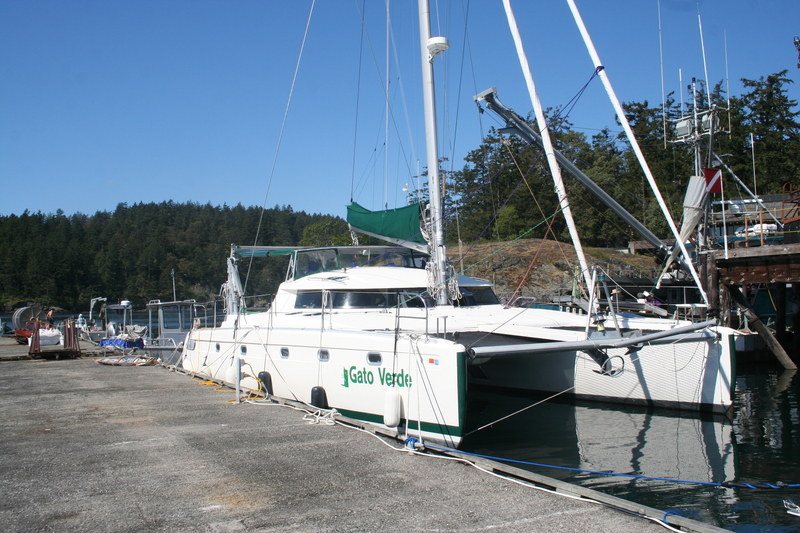 This time we decided to deploy it from the bow of the Gato Verde. After getting it ready to deploy Horace and I waited on the trampoline for the go signal. We waited and waited and finally. . . it started to rain. The camera wasn’t working! We packed everything back up and by the time we had passed Lime Kiln and put everything but the camera away Jason had fixed the camera. It was a great example of Murphy’s Law! Today was a bit choppy. We didn’t hear anything about where the whales might be, much to our disappointment, so we decided to head down the West side. 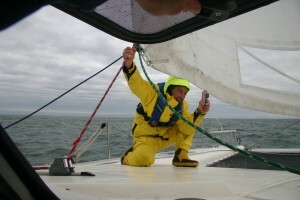 There was a lot of wind so we got to do a bit more sailing. 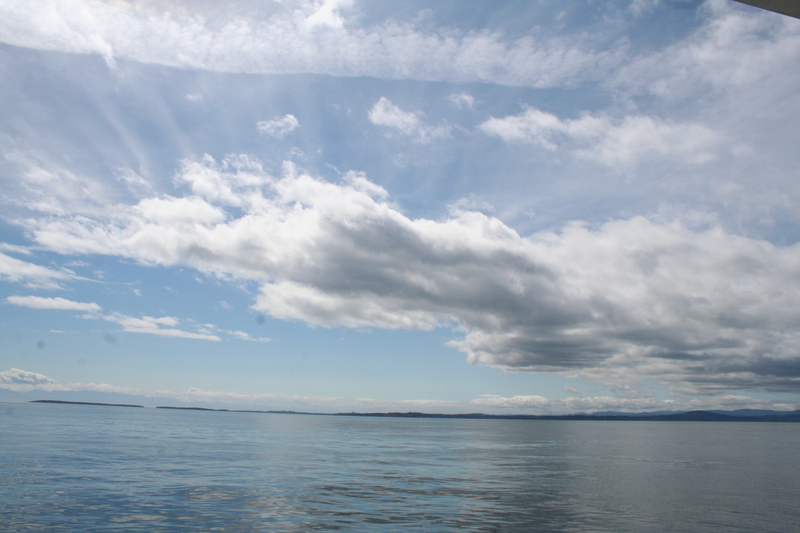 We didn’t see any whales and so shortly before lunch we decided to go to Mackey Harbor on Lopez Island because the tides wouldn’t shift for another 2 hours and drifting was beginning to become less and less pleasant. 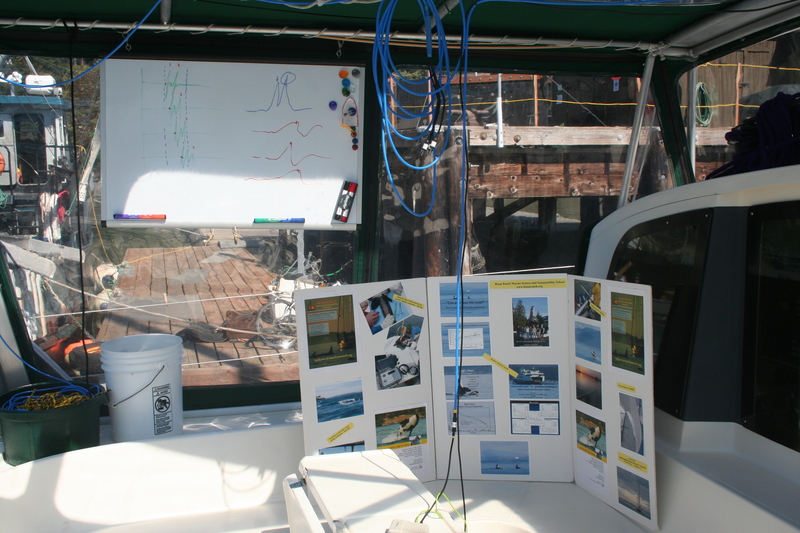 We pulled into the harbor and learned how to take the data from the calibration recordings and calibrate the hydrophones. It was a bit confusing but in the end I think I got it. You can’t just look at the recordings and figure it out. You have to have a hydrophone with a built in tone creator that can create a tone that is a certain known amplitude. Then you have to look at another recording from the same hydrophone and, using the known tone, figure out what the received level of sound was in that recording. 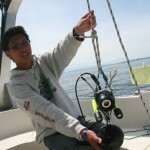 Then you use that known sound to calibrate the other hydrophones by looking at the same time on all of the recordings. Long and involved I know. Amazingly enough hydrophones that can create an internal tone of known amplitude are pretty few and far between, outside of the Navy. 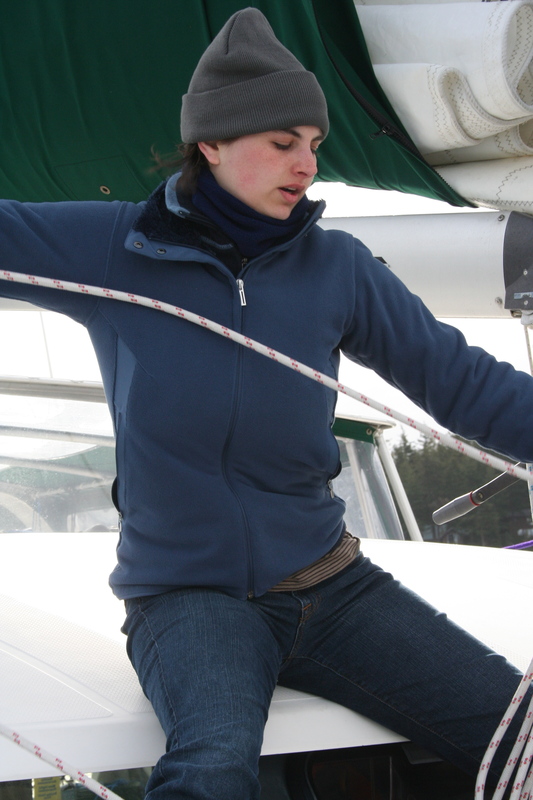 Around 4:00 we decided to motor back up to Snug Harbor because the weather on Monday is supposed to have wind up to 35 knots, which we can’t go out in, and we need to be in Snug on Tuesday to pick up Val! The weather was amazing today. 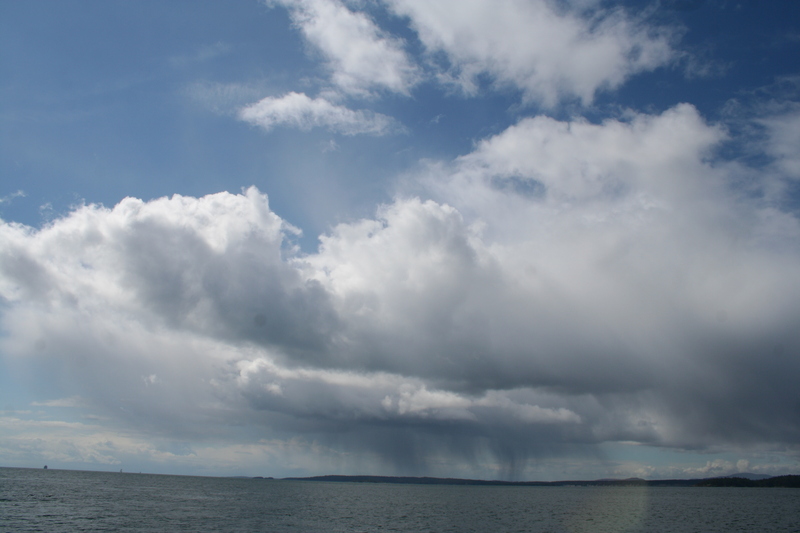 It was completely sunny till about 6:00 but the entire day it was blowing from about 20-34 knots in Haro Strait. So needless to day we didn’t leave Snug Harbor. 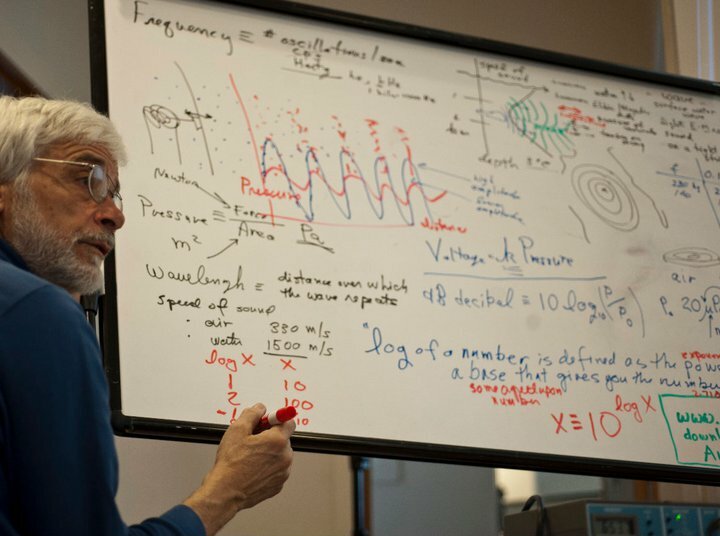 We spend the day working on our various projects as well as doing our behavior exercise, which basically consisted of Jason in the dingy writing behavior states on the whiteboard and having us record the information on PDAs. It was incredibly amusing, even though we thought the PDAs were broken! After dinner we got to watch an episode of the show produced by Jacques Cousteau, a true explorer. It was a relaxing and enjoyable day. Val came aboard this morning! The weather today was nice. It was sunny and warm with only a light breeze. 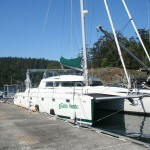 We spent the day drifting on the tides staying North of San Juan Island. 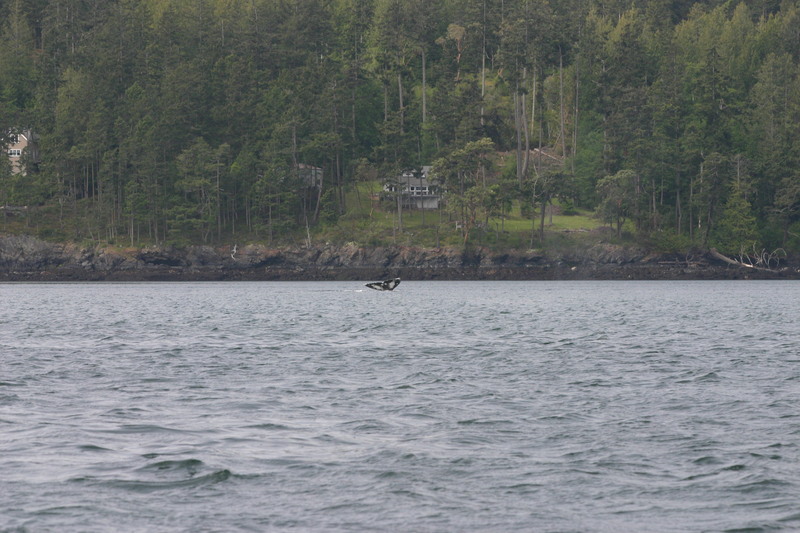 We saw a few porpoises foraging in the convergent zone at Turn Point and even saw them jump out of the water and chase after the fish at the surface. It was pretty wild especially since I usually think of porpoises as ‘the dorsal fins that appear and disappear rapidly that don’t do much else’. 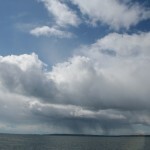 A while later, around 4:00, I saw some lightning strike land on the Vancouver side so we decided to head in to port. 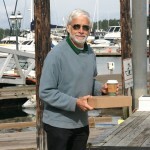 We stayed at Reid Harbor, which is the harbor across from Prevost Harbor on Stuart Island. This side too had a major hill leading to the bathroom. On Stuart Island you have to EARN the use of the bathrooms. 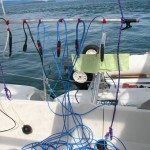 Later that evening, we looked over our calibration exercise and found out that while blueberry is calibrated within expectable boundaries Libby’s hydrophone needs be re-calibrated. Today we decided we needed to to pump out our holding tank (sewage) and conveniently enough there was a barge to do so in Reid harbor. 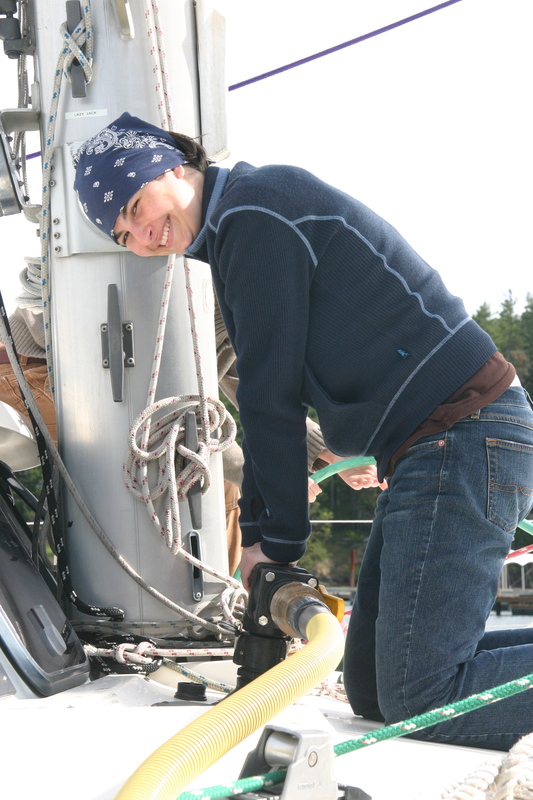 We went over and started the process then realized that the pump wasn’t pumping, so we had to ditch the barge and go to Roche Harbor instead. While there we pumped out, Val bought propane and Jason bought milk. Very exciting I know. 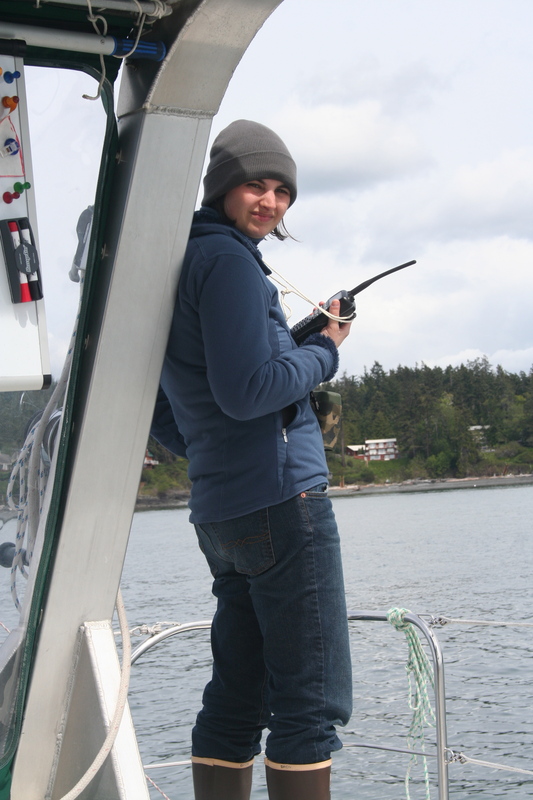 We head out to drift along the west side of San Juan Island to try and listen for the whales, now that we had an easy deployment hydrophone that Jason put below the Gato Verde that morning. We didn’t hear anything of note, but the weather was nice so we decided to revisit the light bulb popping exercise. 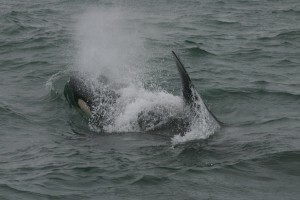 The first one at 100m from the boat went off spectacularly! The imploding light bulbs sound a little like gunshots. It was amazing to listen to! After that more and more problems just kept coming up. During the exercise I was on the range finder, recording the distance between the Gato Verde and Gatito, as well as the radio. I have to say I am not the most adept at radio communication. 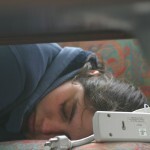 It is kind of odd how flustered I got calling on the radio, it is a little like stage fright. I would say the most convoluted and confusing things because my mind blanked and I couldn’t think of the appropriate word. It was fun though. After that we decided to head back to Snug Harbor for the night. 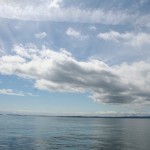 We decided (again) to drift around North of San Juan Island and, once again, saw no whales! We think that the Residents have gone back out to sea for a while; apparently this happened last year as well, though not quite as late in the year. Jason and Val gave us fake data sets today so we could see how we are going to analyze it and what data we really needed to collect. It turns out that my data sheet is completely useless and I will have to make a new one. I actually need to pay attention to fewer things, but that means that my current data sheet is unsuitable. 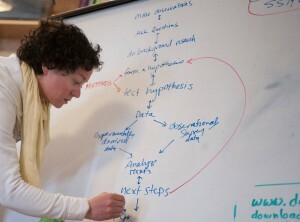 My hypotheses also have undergone serious reduction and refinement. I still have three hypotheses but the three I have now were actually only one of my original three. Though organizing and analyzing the data was exceedingly useful, I spent the day trying not to destroy my computer while doing so in Excel. 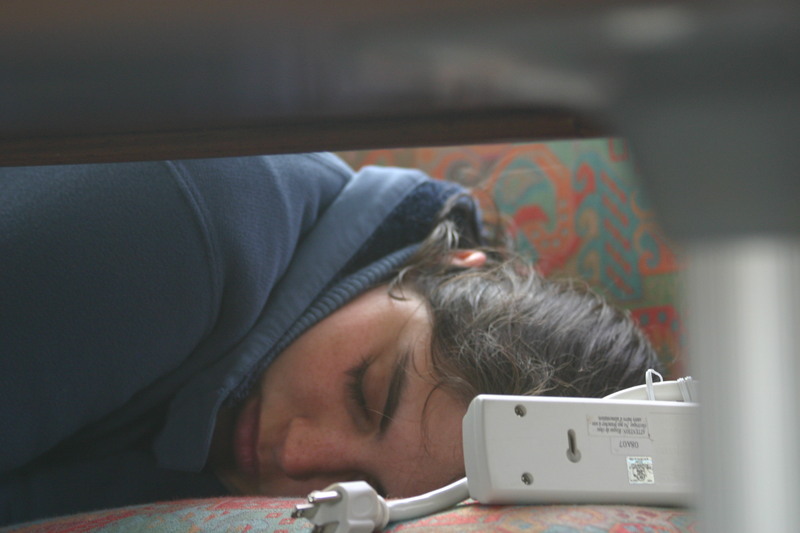 I am very aggravated with Excel right now and I wish I could easily give pc people numbers documents! I finally figured it out, with a lot of help from both Jason and Val, and have completed my fake data set analysis. 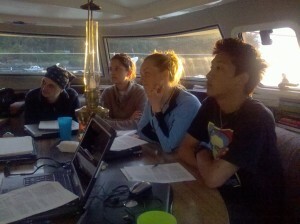 Now we are sitting in Westcott Bay working on our proposals which are due on Friday. Oh, we also saw some harbor seals that we think were mating, but were not sure they could just have been splashing around a bit while playing. Today after breakfast, since we were in a quiet harbor, decided to recalibrate Libby’s hydrophone. It went well, but this time since we knew that there were harbor seals in the bay we decided to ramp up the tone amplitude slowly so the seals could move away from the sound if it bothered them. 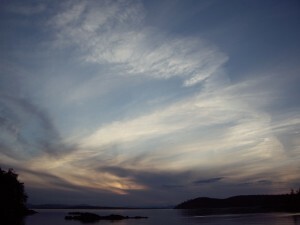 After we headed out we decided to go north and drift hoping the whales would be there. Our proposal is due tonight and tomorrow is the open house so we will be docking at the labs. 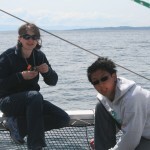 While we were heading out north of San Juan Island we decided to have watches for marine mammals. 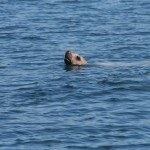 I was on the bow and saw a number of porpoises as well as a sea lion. 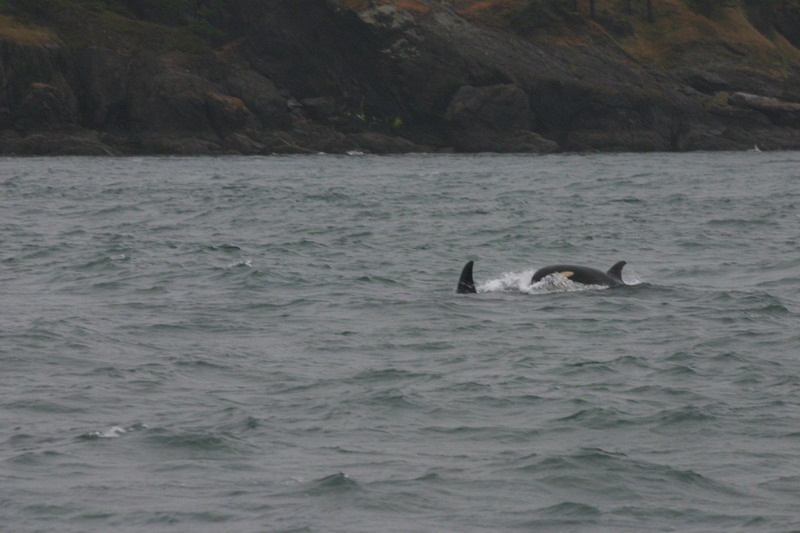 At about 2:30 we were informed that there were a few Transients only a half hour from where we were so we decided to go check it out. We motored up and found them! It was awesome. There was one female and one adolescent male. We deployed blueberry and managed to hear one call! Our first live acoustic recording! They were socializing and milling for a while before they decided to leave. There was one very oblivious boater that motored at high speed right over where they were and only slowed down well after they passed them. This, for those who don’t know, is very much against the law as orca are an endangered species. After that we decided to motor back to the labs to take showers and do some laundry!